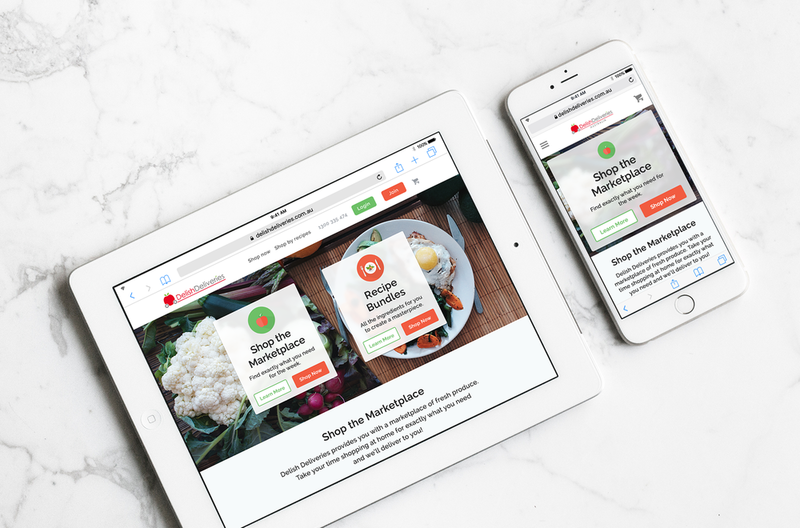 Focuses on delivering fresh fruit, veg, meat and seafood straight from the farmers market the day it's delivered to your door within the greater Sydney area. They aim to use minimal to no processed sugar and/or grains in their recipes, ensuring a healthy and balanced diet. Delish took an iterative approach to their business model and now they offer seasonal boxes, a market place to select what you want each week, meal plans and shopping by recipes. To help replace their existing website with a responsive solution, it wasn't surprising to discover that there was an increasing amount of customers coming to delishdeliveries.com.au from mobile devices. That being a key driver for this project. I also applied their new brand identity and aided in conversations with their offshore development team when in came to the CMS, front end development and functionality. I worked with the business owners to helped them bring their start up and vision to life and to be an advocate for their customers. I engaged with the offshore development team to aid in front-end and back-end technical discussions. My key responsibilities were to understand the current customers pain points, sift through Google Analytics, create information architecture, ideate with the owners, generate wireframes, perform guerrilla usability testing with internal staff and customers and finally create UI designs. First I worked with the business owners to understand what they felt was and wasn't working well then advocated that we should validate their opinions against customers. Using insights from the owners I created a list of stop doing and keep doing then overlaid another list of what customers were saying. This turned out to be vital as we focused our efforts on areas that customers were having the biggest challenges with and also aligned with the new business direction. Once we had all these insights, I facilitated a workshop were I mapped the insights out. It also included new functionality the owners wanted to go forward with and improvements that customers had been screaming for.